I like pizza quite a lot, but my wife loves it. She told me last night that Pizza is the one food she can “over-eat.” I could not start to list the foods I will predictably over-eat given the opportunity, but my wife has this super-human self-control. So this confession tells you that pizza is really special to her. I've made some pretty good pizze and some not so good. Last night I made the best pizza I've ever made by a long shot. In fact, I do believe it was the best pizza crust I've ever eaten. 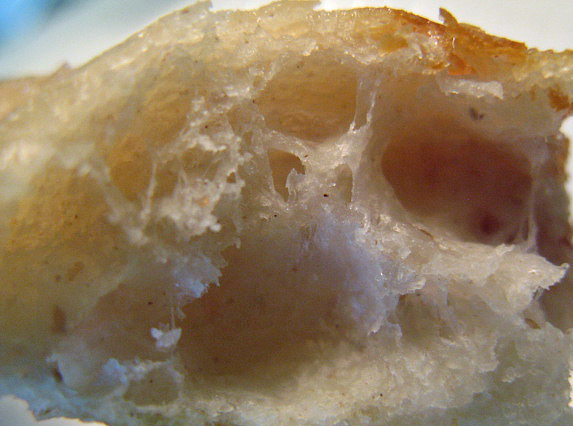 The crust was based on the “Overnight Pizza Dough with Levain” from Ken Forkish's Flour Water Salt Yeast. I say “based” because, while the ingredients and procedures were pretty much as Forkish prescribes, the timing of many steps was different. Some of those differences were planned, and some were …. accommodations. I'm not going to claim that the crust turned out so well because of my baking genius, but I am going to try to capture what I ended up doing so I can do it again … on purpose next time. * Percent of total flour that is pre-fermented. Dissolve the levain in the water. Refrigerate overnight or for up to 2 days. Take the levain out of the fridge 1-2 hours before mixing the final dough. Mix the water and flour to a shaggy mass and allow it to rest, covered, for 20-60 minutes (autolyse). Sprinkle the salt over the dough and add 180 g of the levain divided into 4-6 pieces. Mix using the “pinch and fold” procedure described by Forkish. Transfer the dough to a well-floured board. Dust the dough and your hands with flour. Divide the dough into 350 g pieces. (You will get 4 pieces of 350 g and one that is larger. Shape each piece into a fairly tight ball and place them in ZipLoc-type sandwich bags with a tablespoon of olive oil in each. Refrigerate for at least 2 hours and for up to 3 days. When you are ready to make your pizza/e, 2 1/2 to 4 hours before shaping the pizze, take the number of dough balls you will need out of the fridge. Let them warm up at room temperature for 1 1/2 to 2 hours. The balls should expand by a third to a half. Put the dough balls back in the fridge for the last half hour to an hour before shaping them into pizze. This is because the dough is a bit more elastic and less fragile when cold. Take one ball of dough at a time out of the fridge. Shape it. Top it. Bake it. Enjoy! This “in and out of the fridge” stuff may seem unduly complicated. It happened because we changed our minds about going to a concert a couple times before finally deciding to stay home and make pizza. See, if we had decided to go, there wouldn't have been time to make pizza and eat it beforehand. But, in hindsight, this procedure makes a lot of sense. 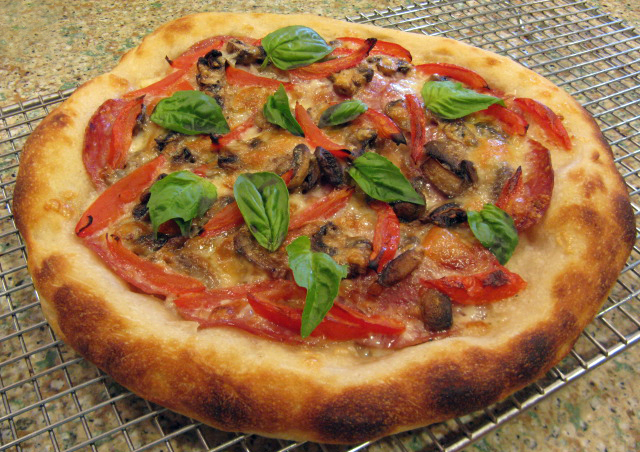 A longer fermentation improves flavor, but retarding the dough in the fridge was needed to prevent over-fermentation. The warm-up in Step 8. just completed the fermentation to an optimal degree. I could have just let the bulk fermentation go a bit longer – say about an hour – and then not needed Step. 8 and 9 at all. This dough was a delight to shape. It had just the right balance of elasticity and extensibility. When baked at 500 ºF for 10 to 11 minutes, the edges puffed up beautifully. They were crackling crispy. The dough under the toppings was moderately chewy but not at all “tough.” The most remarkable feature was the flavor. It was mildly sour but very wheaty, sweet and complex. It was astonishingly delicious. My wife, who often leaves pizza crust un-eaten, actually left the center part un-eaten and ate the outer crust in preference. How much of this was the procedures and how much the use of 98% Caputo 00 flour? That's hard to answer. I suppose I need to make this dough again using a good AP flour to find out. I made two 10 or 12 inch pizze. 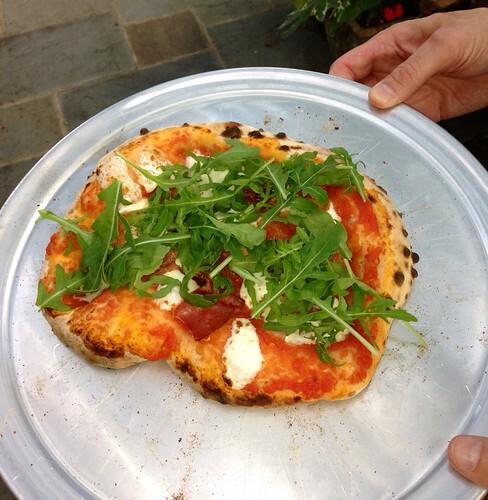 One was a classic Pizza Margherita made with olive oil, fresh mozzarella, fresh, locally grown San Marzano-variety tomatoes which were par-boiled, skinned, seeded and cut into strips and fresh basel leaves from our garden, added after the pizza was baked. Well, we do have 3 pizza dough balls left, including a 380 g one. I am going to make a potato pizza that's been on my “to bake list” for a few years, ever since I first read about it in Leader's Local Breads then again in Maggie Glezer's Artisan Breads. 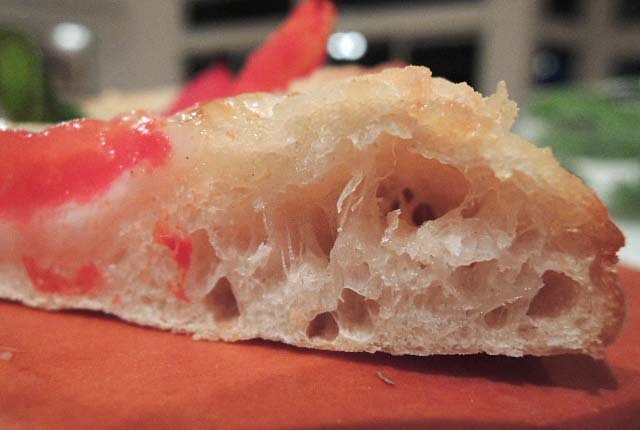 I'll happily follow you with this pizza crust (bookmarking this post), remembering how you captured what you did with SJSD #4 and what an incredibly-good tasting bread that was. Beautiful, beautiful pizza, set off so wonderfully by those perfect basil leaves (and you've got San Marzano tomatoes, too!). 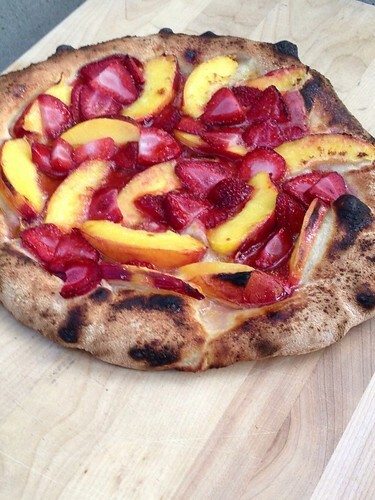 ...preparing to build the levain as we speak...so excited for Monday night pizza night! the dough was silky, beautifully extensible and oh-so-tasty! 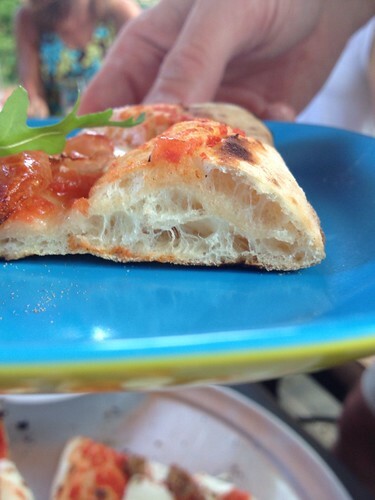 Your pizza is gorgeous, including the crumb shot! I hope Franko sees this. I believe you are much more experienced with pizza than I, so I am relieved that you also found this pizza dough extraordinary. have made pizza before, but not experienced at making *good* pizza. This crust is a breakthrough!!! Niiiice. How about these outer-crust air chambers? Did you fold the outer crust when shaping, or roll it or something? 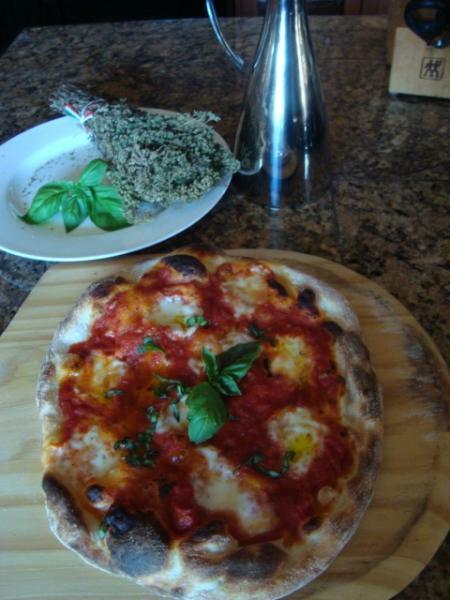 Looks like my ideal crust, and not too much olive oil. Looks great, David. Ok if I feature it? I would be honored to have it featured. having over-eaten some very good homemade pizza on Thursday. Yours looks absolutely mouth-watering. I'm looking forward to reading more about this marvelous pizza steel. David. Well done and thanks for the recipe. We love pizza too! It looks easier than bread in some ways. I am searching for a recipe. I have no idea. I have insufficient experience with Spelt. If you try it, please let us know how it works. if anyone knows please share! its so interesting what makes one grain different than the other. What a coincidence! This afternoon I'll be baking pizza in my wfo for 14 people. I made two batches of pizza dough - Hamelman's pizza dough with biga (heretofore my favorite, made with KA organic AP)), and Forkish's overnight pizza dough with levain (made with Caputo 00). I divided and shaped both doughs yesterday and they've been waiting patiently covered on sheet pans in the fridge. I'm very happy to know that you give Forkish's dough high marks because it does require a bit more time and planning than other pizza doughs. In the wfo my pizza typically bakes for 90 seconds to two minutes. Hopefully I'll have some pictures to share later. I'm in the same camp as your wife, pizza is my kryptonite. Your rendition of the Forkish Levain dough is superb, what a fabulous, open crumb, and must be great flavor, too. 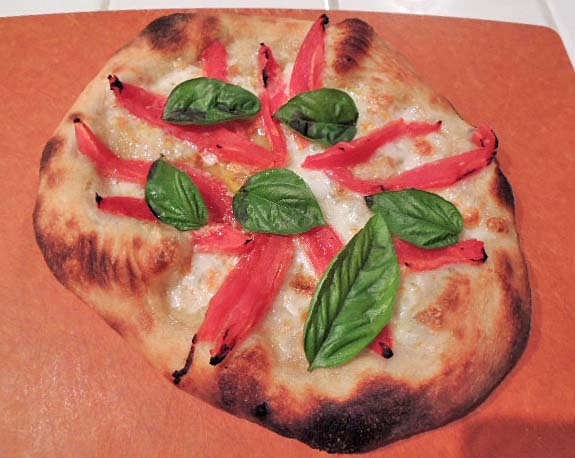 An adaptation of this recipe from Forkish is also my go-to pizza dough, my favorite "flavor" is to bulk ferment to 2.25x volume and to use 16% high extraction wheat flour (sifted) and 4% high extraction (also sifted) rye. It is the one crust that everyone agrees on and loves. For the kind remarks and for sharing your modifications. Do you use a soft wheat flour for the other 80%? I wonder what this crust made with 00 flour with a bit of WW and rye would be like. Probably a bit less open but maybe even more flavorful. It's somewhat soft- gold medal unbleached AP at about 10-10.5% protein. For a 100% white flour crust I like to go a little lower in protein than that, but with 20% hi-ex flour the 10.5% seems about right for my tastes. Thanks for your reply, FlourChild! Here are the results of my pizza party tonight. I made many pizzas (pizze?) using two different doughs - FWSY overnight pizza dough with levain, and Hamelman's pizza dough with biga. As David reported, the overnight dough with levain produced a light, crisp crust with deep flavor and just a hint of tang. The Hamelman dough continues to be one of my favorites. It also makes a delicious crust that can stand up to toppings a bit heavier than the leavin-based dough. 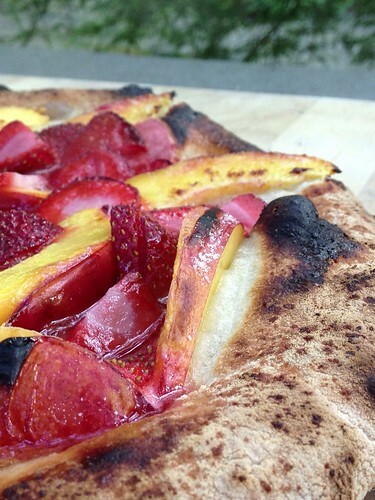 I made classic Margharita (FWSY), NY-style sausage (Hamelman), prosciutto and arugula (FWSY), and a dessert pizza with local nectarines and strawberries (Hamelman). All were crowd pleasers. 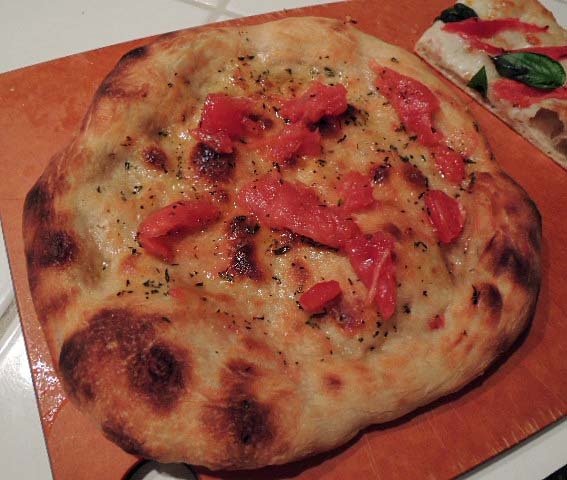 Forkish has a pizza dough with poolish, too. I'll have to compare it with Hamelman's. That oven looks to have a rather substantial capacity. It's a Forno Bravo Primavera 70 with a 28" cooking surface. Big enough to cook two pizzas simultaneously, although I do one at a time because they cook so quickly I don't think I could manage two at once. 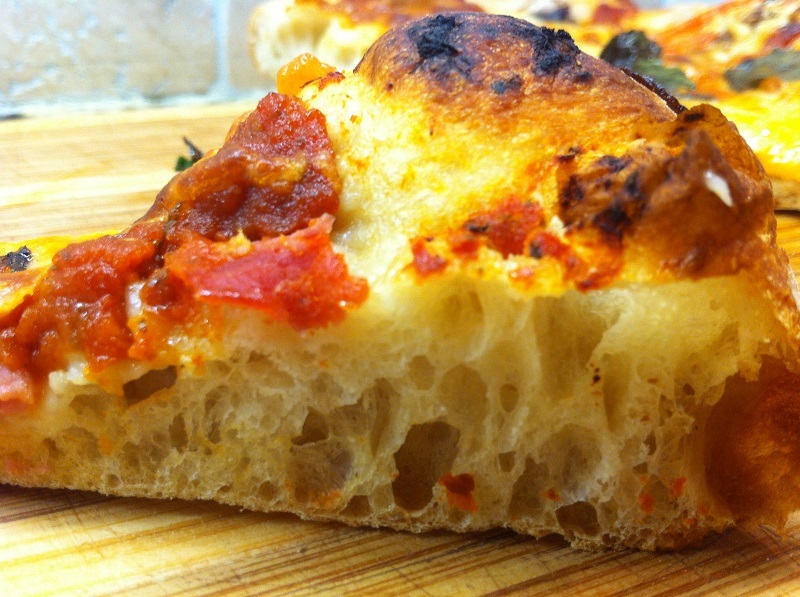 I made Forkish's overnight pizza dough with poolish a couple of weeks ago and it was excellent. I adjusted the hydration to 70% because I find it too difficult to reliably slide the pizza off of the peel at higher hydration during the humid summers here in NJ. When pizza making moves indoors this winter I'll probably make the dough closer to 75% hydration. These pizze look terrific. I am intrigued by your comment that they were the best you ever tasted - certainly enough for me to want to try it. I've not had a lot of experience with Forkish's formulas since I got the book from the library and read through it rather quickly. But my one attempt at his large levain loaf (I forget which one) ended up in a soupy mess, so I heartily agree that his timings are not right for every situation. 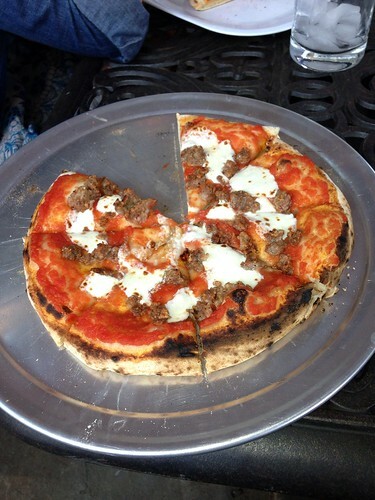 I hope to try the pizza soon, thanks for posting your results. Alright David, as if your last few posts on bakes from Forkish's book weren't enough to convince me into buying it, this pizza and your latest potato pizza crossed the threshold for me holding out any longer. I've never been crazy over the flavour of naturally leavened pizza dough from any I've done in the past, always going back to my standard 200% poolish version that's served me well over the years. 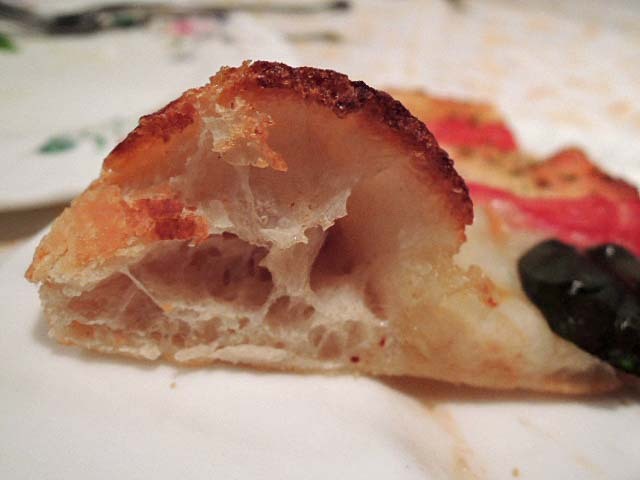 From comments you've made in the past, and comments we've shared regarding pizza crust, I think we're of the same mind on the subject, so If you say " it was the best pizza crust I've ever eaten" that definatley gets my attention.The crust and crumb of your dough is just the way I like mine, airy, blistered and moist. If the flavour is improved by using Forkish's levain and method, and it results in a pizza dough like this then it's a done deal. The old bookshelf is groaning as it is, but a Kindle version is available so I'll go for that to save space. I appreciate your well considered views on Forkish's book David, thanks for taking the time to write them up and share them with us. Whew! The pressure is rising! I sure hope these results are reproducible in both my kitchen and in yours, Franko. Please do let us know when you make this and how you like it. Seriously though, I'll give a full report and comparison between my present formula and method and Forkish's once I have the time to bake and document them both. Hopefully by Sunday. It is a relief to have corroboration from an exceedingly reliable witness. In fact, I think breadsong just raised the bar a couple of notches. Did you see ...preparing to build the? Thanks for letting me know about breadsong's pizza David, I might very well have missed it. Breadsong does have a way of raising the bar doesn't she? Before I can try this recipe for myself I've got to track down some 00 flour first. I'll have a look when I'm in town today but I doubt our local organic store carries the Anita's 00. Fortunately I know where I can find some for sure, but it's in another store in another town, so it'll take a few days before I'm back in the vicinity. I'll keep you posted David. thank you all for sharing.. I know where you are coming from; "Ananda" is a Sanskrit word meaning a "state of bliss". I am keen to know where Franko goes with your challenge. Methinks he doesn't really like "00" flour too much. Just got back from holidaying in the heat of Southern Spain, and I suspect I might be causing a hint of trouble here???! Anyway, my idea of what pizza really is; great stuff! I've actually never used "00" before so no opinions one way or the other. My standard pizza dough uses Anita's AP which gives a nice crumb if the hydration is in mid 70% range and it's worked very minimally. Still, in the interest of being faithful to the recipe David so kindly shared in this post, it would skew the results if I didn't use 00 flour, and I'm always up for trying new flours/ingredients anyway. If I can achieve a crumb similar to David's, with the flavour he describes by using 00 so be it and with no hesitation on my part whatsoever. It will be hard to improve on that crust's appearance! It looks delicious. I'm really looking forward to your experience with 00 flour. Some swear by it, and other's say AP or BF is just as good for pizza crust. Maybe while you are trying 00 with this formula, I should be trying AP flour. Thanks David, but this on and off again quest of mine for the perfect pizza dough seemingly has no end to it. While I've managed to get the kind of crumb and crust that I like using AP, there's always room for improvement in flavour. I'm hoping that Forkish's naturally leavened version will provide that. Whether 00 flour is a necessary part of that equation remains to be seen, but I'm looking forward to finding out. Your post has roused me out of a long complacency with my pizza dough.Thank you..? Finally managed to do a pizza bake using 00 flour and the formula above, however it didn't yield the results I was hoping for. Everything was humming along nicely up until the time I put the dough in the fridge overnight. Took it out after 11 hours and let it warm for more than 2 hours before I shaped it, then almost 90 minutes more for final. Now whether the dough ran out of oomph, or it needed more time to rise, I can't say for sure either way. The pizza was meant for a work night dinner and I ran out of time to get it baked and eaten before hitting the sack, so perhaps it needed more time than I had to give. The crust wasn't exactly a cracker, but pretty close. It tasted just OK, and fortunately the toppings tasted great. I'll continue on with this project but next time I'll do it on a day off. A few photos of the results. Before the pizzas in the OP, I would have regarded that as a success, were it mine. With the new standard, I'd say the dough looks kinda tired. The topping, on the other hand, looks great! What is the white sea on which the tomatoes are floating? I've presented myself with another test of this dough. I froze a couple balls from the first batch. They have been thawing in the fridge since last night. I plan to make one pizza with a roasted tomato sauce and another with eggplant and cherry tomatoes for dinner tonight. If the thawed dough performs, I'll be very happy. That pretty much describes it David, a tired and unenthusiastic dough. Odd, because as I say the dough was looking quite healthy at the time it went into retard. Hard to imagine it over-fermented in a 50-53 F environment but something obviously went awry in the process. I've certainly made worse pizza dough in my time and it was entirely edible, just very ho-hum compared to what I'm used to. Poor execution on my part...now I just have to figure out which part. The topping was simple and tasty, dough brushed with roasted garlic oil, (a staple pantry item) slices of ordinary mozzarella, and sliced extra sweet cocktail tomatoes sprinkled with Parmigiano Reggiano. Ground black pepper and fresh basil to finish once it was baked. Please let me/us know how your frozen dough preforms, I expect it will do as well as the original. When I make any progress with my own project I'll update on this thread. Actually, everything was delicious, except the crust. The pizza dough was frozen, thawed in the fridge for 24 hours and proofed at room temperature for 1 hour before shaping. It had minimal oven spring. It was dense and very chewy. It didn't taste bad, but the fantastic, complex flavor was gone. The dough still had good elasticity. I don't think proteolysis was the issue. But the taste was deteriorated. The crust did not color normally. It was sort of a dull brown, not a good Maillard-effected crust. I think the beasties had eaten all their food and just weren't fermenting any more. I am inclined to write off freezing pizza dough entirely, but so many books tell me it works. If it does, I think it requires a younger dough. 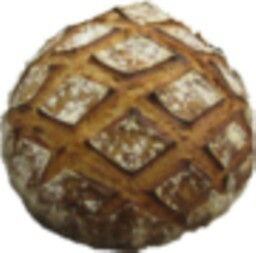 Forkish does push the limits, and his levains and doughs seem to be very mature before they get used. This in spite of him presenting himself as of Chad Robertson's school of thought regarding using younger levains, etc. I have certainly over-proofed my share of loaves, but I don't have much experience with over-fermented dough. Maybe my hypothesis is off base. What do you think? David, thanks so much for reporting your results with frozen dough! I have never tried to freeze any dough made with sourdough- little critters seem so fragile- and you have convinced me that at least this recipe isn't the place to do it. Your point regarding sourdough yeast vs. Commercial yeast resiliency in frozen dough is very interesting. And your par-baking pizza dough sounds like a great idea. I'll have to give that a try. After giving this some thought during work today, I think your hypothesis is on the money David. We sometimes need to freeze popular seasonal items in our shop, in particular hot cross buns during the week or two before Easter. When scaling the mix we increase the yeast percentage slightly by 2-3% and pan the buns up as soon as the dough comes off the mixer, then get them straight into the freezer. The buns can be held this way for 5-6 days without any appreciable loss in flavour or leavening power. The fat content in the HC mix helps to coat and protect the yeast cells from frost damage as well. When I got home from work today I checked what Suas had to say about freezing dough in AB&P pgs 167-173. Suas notes in his Frozen Dough Conclusion pg 173 that " for very short freezing times of 1-3 days, a normal baking process with a slight increase in yeast and shorter fermentation time can lead to good results in small bakery settings". He goes on to say that natural sourdough bread dough won't freeze well because the wild yeast and bacteria are very sensitive to cold and will be damaged by a long stay in the freezer. It would seem that not enough of the natural yeast cells in your pizza dough survived the freezing to be able to properly ferment the dough, hence the minimal oven spring, pale colour and lackluster flavour. An experiment one or both of us could try would be to increase the total natural leaven by 20-40 percent to up the yeast cell survival rate, perhaps adding 3-4% olive oil to total flour, and decrease the bulk ferment temps and times before freezing and see if that would deliver a healthier dough once it was thawed. Worth a try at the very least wouldn't you think? Having Suas' word on this is reassuring, at least in the sense that there is a rational explanation for what was observed. Thanks for looking it up! If I thought the flavor of the pizza with levain was so superior to yeasted and that there was a dough ball's chance in hell that that superiority could be maintained by increasing the percent levain or any other maneuver, I'd believe the experiment was worthwhile. But I'm now skeptical. I am thinking the SD yeasts are just too fragile, but I recognize the rationality of your proposal. I think my next step will be to try Forkish's pizza dough with biga 1) to test the quality of that product and 2) to freeze some of the dough before fermentation is complete to see how it bakes up after thawing. For now, if I make the pizza dough with levain, I'll just make what I will use over 2-3 days. I have laid in another 2 kg of Caputo tipo 00 (red bag). Maybe this weekend. Anyway, it is fun (and instructive) sharing notes. Let's continue. When I made the pizza last week, the one that didn't have any life to it, I had a similar weight piece of dough left over from the mix that I'd intended to bake the next day. After seeing the results of the first bake I thought I'd just use it in something else and then kind of forgot about it for 3 days. When I finally did remember to check it, lo and behold it was showing definite signs of life, having doubled and with a few gas pockets showing. Thinking I might as well feed it and see if I could bring it back to health I gave it the same proportions of flour and water from the original leaven and let it sit at room temp for an hour before putting it back in the fridge for the night. It had quadrupled by the time I checked it later the next day, about 12 hours later. I fed the dough once more and gave it another overnight. Yesterday I took a portion of it to use as levain, increasing the final mix percentage to 30% over the original 20% and proceeded with the final mix keeping all but the salt % to the original formula. Roughly a 90 minute BF, with a 15 minute rest before shaping. Final proof of 35-45 minutes while the oven was preheating. Here's the results after 13 minutes at 550F. Certainly an improvement over the previous bake with better colour, lift, and much better flavour, but not as good as I'd hoped for, nor as tasty as the poolish dough I usually make for pizza. I'll make a few more mixes of sourdough pizza to try and make improvements, but I'm beginning to think the payoff isn't worth the extra time involved compared to the poolish version. With the levain left over from yesterday's bake, I used it all ( 50-55% final mix) in a focaccia bread that just now came out of the oven. Maybe focaccia bread is a better application for naturally leavened dough than it is for pizza. I'll have a better idea if that's case when I slice this bread later today. You know, I can't taste it, but the pizza looks pretty good to me. 2. Mix the dough at 4-5 pm, when I expect it will be ripe. 3. Divide the dough before it is fully fermented, maybe when it has expanded by 50-75%, and refrigerate some and freeze some. 4. 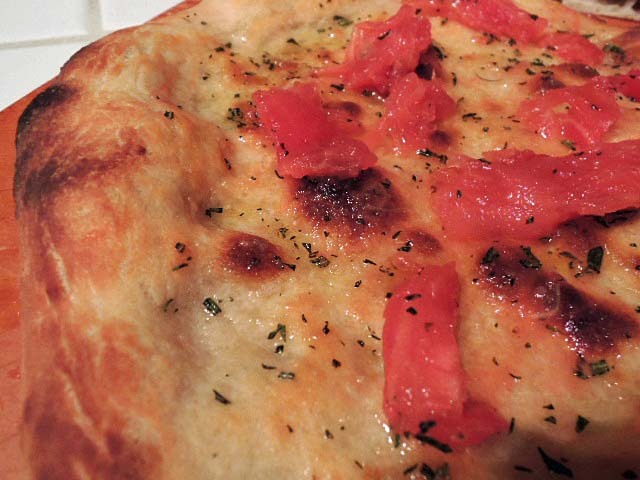 Make pizza or focaccia tomorrow. Thanks David, the pizza was good, just not great.On the other hand the Focaccia turned out to be one of the best tasting ones I ever done. The mild tangy flavour of the sour really comes through, and compliments the rosemary/ garlic/ olive oil topping and the grated parmigiano.
" I've basically given up on his sample schedules." I agree, following someone else's schedules when you already know your starter, environment, and what to look for during fermentation as well as you do isn't necessary. I'd like to think Mr Forkish would agree with that as well. I'll have to make another run for 00 later this week if I want to make more pizza next week. Good luck with your next bake! After hearing your rave reviews and seeing your lovely pizze :) I've been trying to get it together and make Ken Forkish OPDWL. Like you, I adjusted to my time waves. I tend to be a night owl. My finished dough balls went into the frig late last night. I made seven balls of dough, wanting to stretch the pizza out for a thinner crusted version. He uses a lot of dough gms for one ball of dough, which is great for either a very large pizza and/or a big blooming crown and thick crust. My confession is, I pretty much had sworn off using my Caputo 00 flour for an indoor oven pizza but, I have never made it using a levain. The Caputo 00 gives pizza dough a lovely and, very nice tenderness. It has a softness yet at the same time a great little crunch, crisp to the thin crust. The smell, flavor is very special too. A pleasure to handle because it's so extensible. No wonder the Italians love it so much for their pizza's. 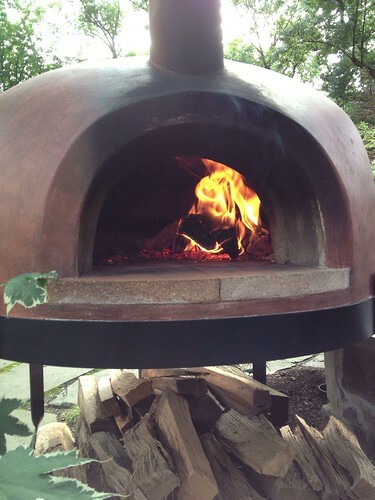 Caputo 00 flour loves the heat and works best with the hottest oven you can provide. So tends to brown a little differently in a regular electric oven. I pre-heated my stones for about one hour at 550F. The combination of a long fermentation, levain, Caputo 00 flour and a very hot oven, makes for a great tasting pizza by any means. Not to ramble to much...but I had a hair appt. today and wanted a fast easy dinner. So I used 2 pizza dough balls today about 4 pm. They almost made it to 24 hrs...but I have the rest...I may freeze them for later. David, Have you tried pasta made with the Caputo 00 flour? It's delicious and works up wonderfully. I prefer it over semolina. They say to pop those large bubbles..but I like them, they char up so nice. I'm happy you and Mike enjoyed it. Thank you for your description of the Caputo 00 effect. You really captured how it worked for me. It's nice to know that is characteristic. I have never used this flour for anything but pizza dough, and that only once before. On your recommendation, I will try it for pasta. I imagine the flour: egg ratio might be different than with AP flour. What ratio do you use? It's my very favorite flour for pasta. It handles wonderfully passing through the pasta machine. I use my KA pasta attachment. I have some blogged photos of the pasta being made. The taste is wonderful too! I believe Caputoo 00 flour is very commonly used in Italy for pasta making. I pretty much go with Jamie Oliver's recipe. I just cut it in half. which using - 3 Eggs or 6 Egg Yolks - 600 gm. Tipo 00 flour - I use the Chefs Blend in the red bag. I mix in my food processor and make adjustments addling more flour if needed. Jamie Oliver has an fun to watch excellent pasta making video on You Tube. Though he is using a Farina, his instructions for watching and testing the consistency of the pasta dough is easily understood. He describs the sound, look and feel in this fun video titled. I love this guy's website - he does a lot of WFO baking in his backyard with his beautiful garden and kitchen. not sure why my links are showing up in the bar.